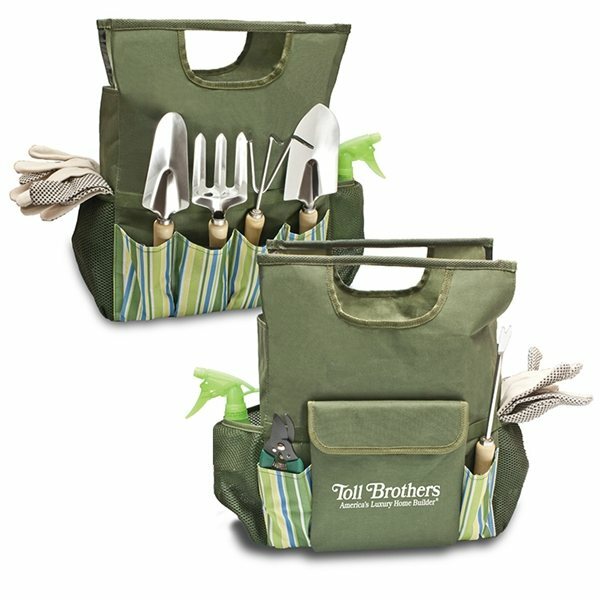 About this 10- Pc Garden Tool Tote:This deluxe Garden Bag has everything you will need to satisfy your green thumb. Set features a large waterproof carry tote with pockets all around for all of your handy gardening tools. All tools are feature a wooden handle. Set includes Water Misting spray bottle, hand trowel, bulb trowel, weed popper, three pronged cultivator, forked spade, pruning shears, roll of garden tie & non slip garden gloves. About this 7 PC Garden Tool Set:Garden tool set includes a 400ml spray bottle, zinc plated broad and narrow trowel, a 3-prong cultivator, locking crescent blade pruner, leaf and flower trimmer, and waterproof tote. About this Tri - Fold Shovel:Hardened steel shovel blade with one side serrated to help cut through packed dirt, roots, and tough foliage. Great for camping, gardening, and other outdoor use. Nylon carrying pouch with belt loop. About this Kikkerland Pocket Pruner:12-in-1 garden tool is great for pruning and grafting. Stainless steel tools inside a beech wood handle include knives, screwdrivers, can openers, saw and file blades, ruler and wrenches. About this Kikkerland Pocket Trowel:5-in-1 garden tool in stainless steel and beech wood has trowel, weeder, saw, root remover and pruning knife. About this Folding Multifunction Shovel:This Folding Multifunction Shovel is constructed with durable tempered steel and a comfortable rubberized grip for handling. Its compact and light weight design make it great for easy storage. This versatile tool lends itself to a number of outdoor activities including gardening, camping, or hiking. Material: Tempered Steel. About this Garden Tote:600D polyester. Large main compartment with Velcro closure. Full size front pocket. A number of tool pockets and slots on both sides and the back. 4 interior open pockets. Webbed handles. About this Garden Tote:12 oz ramie canvas. Roomy main compartment. 7 side pockets all around the bag. Built-in elastic gores to secure garden tools. Stitched webbed handles. Rubberized bottom. (Tools not included.). About this Mini Stainless Steel Folding Trowel:Heavy-gauge stainless steel blade. Compact design. Convenient to carry. Ideal for travel and outdoor use. Polyester carrying pouch. About this Gardener Seat Tools:There are those who regard gardening as a spiritual endeavor, with healing properties for the soul. Those people need the The Gardener Folding Seat with Tools…period. The storage tote has 1 detachable polyester storage tote (12" L x 7.5" W x 12" H) and 5 metal garden tools (12.125" large trowel, 12" small trowel, 11" garden fork, 11" cultivator/rake and 12.5" weeder).Lightweight and portable. Sturdy steel frame.Tool pockets on the exterior of the storage tote make them readily accessible when sitting in the seat.Storage tote fully detaches from the seat for versatility. About this Large Garden Tote:The Large Garden Tote combines convenience and practicality to give you a gardening tote you will want to use all the time. It comes with three metal gardening tools secured in an easily accessible exterior pocket. Attractive and durable fabrics with a stain-resistant interior make this tote the perfect gift for those who love to garden. Thank you Breanna and Eli! Our 10-Pc Garden Tool Tote is an item everyone will love to have. The tools that are included in the tote will be convenient for any gardening issue your customer comes across. From a hand trowel to a weed popper, your customer will love this item to use on their lawn and garden. Your company logo will be displayed on the outside of the tote as your customer will be working on their garden, so let your company flourish with this product. Set features a large waterproof carry tote with pockets all around for all of your handy gardening tools. All tools are feature a wooden handle. Set includes Water Misting spray bottle, hand trowel, bulb trowel, weed popper, three pronged cultivator, forked spade, pruning shears, roll of garden tie & non slip garden gloves. Grow with your company with this convenient custom Tool Tote now! Your customers will be able to dig themselves out of any situation with our top selling shovel. The folding multifunction is what makes this item very popular. Give your customer the freedom to dig at any angle. This tool is very convenient for campers that have to build their own campsite. With the compass feature, campers will be able to reach their destination in no-time. Constructed with durable tempered steel and a comfortable rubberized grip for handling. Its compact and lightweight design make it great for easy storage. Lends itself to a number of outdoor activities including gardening, camping, or hiking. Our selection of promotional Lawn & Garden tools will interest your customers who’re green thumbs. For anyone that loves to work on their lawn, will love our selection of products. Participating in a Home & Garden tradeshow? Our Lawn & Garden tools will offer a variety of custom products that will be perfect to giveaway. From a trowel, to a gardening set, your customers will love our products. Our style of imprint is always dug to perfection, and made specifically to your design. Bloom your company into a bigger brand with our selection. Tote away your struggle to find the perfect Lawn & Garden tool. Customize yours today! Check out our available selection here! 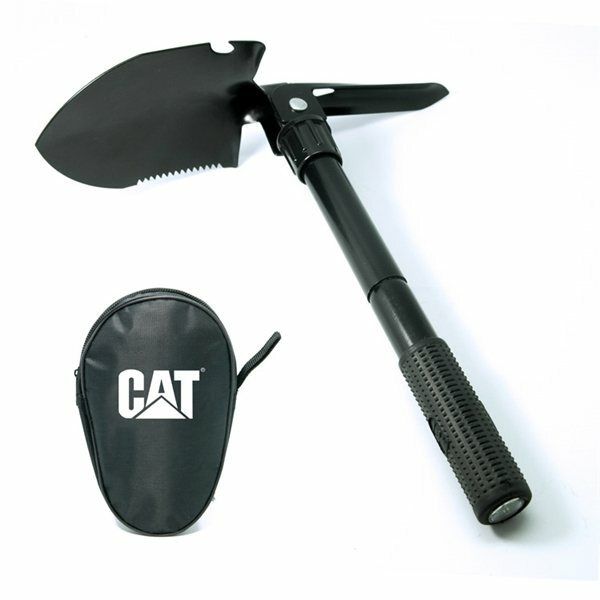 Our custom lawn and garden tools are durable, practical and effective promo items. Every eye catching piece is specially priced and professionally imprinted to vividly promote your brand long after it's handed out. Let’s make marketing make cents! Enjoy our huge selection of promotional lawn and garden tools. Check out more cool lawn and garden tools on sale now! Take a sneak peek at our stock of customized lawn and garden tools currently available. Feel free to give us a call, and we’ll help expedite your order! Our selection of Lawn & Garden custom tools will be a definite hit at any outdoor trade show. Give away an item that customers will be able to use at home! Need help ordering? Our live chat is accessible on our website, or you can call us at 877-368-5678. Your customers will love to use our tools when working on their lawn. The durability of our product will ensure a long-lasting effect.